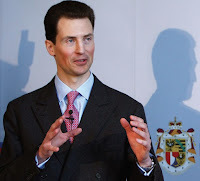 The acting head of the Principality of Liechtenstein, Prince Alois, has announced that an Indian request on sharing of information on stash money will be considered only after the double taxation avoidance treaty and other tax-related deals have been concluded. After a recent meeting with Finance Minister Pranab Mukherjee, Prince Alois said the agreements were still at an exploratory stage, thereby hinting that it would be a long time before India recovers the mounds of black money — unofficially pegged at around $1.4 trillion. "We would like a double taxation agreement, rather than a treaty just for a tax information exchange. We are, after all, more than just a little island offering offshore financial services. So we think a double taxation treaty would help trade, besides complementing the FTA, thus enhancing business on both sides by reducing yet another trade barrier,” the prince said." Nobody should be signing Double Tax Agreements with countries like Liechtenstein. It is essential to understand what is at stake here. Broadly speaking, countries sign two kinds of agreements with each other, as our recent briefing paper on this explains. First, there are Tax Information Exchange Agreements, which concentrate only on the issue of transparency and, well, information exchange. These are the agreements that people need to sign with tax havens, or secrecy jurisdictions. The second kind are Double Tax Agreements (DTAs,) which is what Alois is talking about. These are much broader frameworks -- and they often include an information-sharing component - for deciding which country gets to tax which bit of income from a cross-border investment. The aim, you see, is to avoid "double taxation" - that is, that both jurisdictions don't tax the same income. That would, we agree, be unfair. But what we don't like - and this is what so often happens when you avoid double taxation is that you get this other thing - double non-taxation. With a "normal" country, it is possible to sign an agreement whereby the income does get taxed in one or other jurisdiction. When you sign a DTA with a tax haven, however, what happens is that an agreement is reached to cut back on the taxing rights of the nation that hosts the foreign investment (the "source" jurisdiction, in the parlance - in this case, it would be India) - but the income would again not get taxed in the "residence" jurisdiction that is the source of the investment - in this case, Liechtenstein (though note that Liechtenstein isn't the real residence location here: it is merely a conduit for investors who are resident from elsewhere, who would put a subsidiary in Liechtenstein in order to get the treaty benefit - the knocking out of the tax charge in India.) Sorry, there's no easy way around the gory details: international tax is complex. So Liechtenstein is looking to turn itself into a conduit for investment into India, raking off some fees as the billions flow through, and helping wealthy capital owners (often wealthy Indians, round-tripping their capital back home after dressing it up in offshore secrecy) to shake off the tax charge, leaving poorer Indians to pay it for them. So India should not sign a DTA with Liechtenstein. A tax information exchange agreement (TIEA) should be quite enough. But they don't even want to do that. This is not the first time an Alpine secrecy jurisdiction has sought to push India around. Read more on Switzerland's bully tactics in the first article of our latest edition of Tax Justice Focus. "Finance minister Pranab Mukherjee on Friday told delegates at the Hindustan Times Leadership Summit that India has written to 78 countries to amend existing tax treaties, insisting on their adding on Article 26 of the Model Tax Convention of the Organisation for Economic Cooperation and Development (OECD). "We are regenotiating the double taxation avoidance agreements (DTAAs) with 78 countries," Mukherjee said." This is, unfortunately, only under the OECD's woefully inadequate "on request" standard of information exchange. But it is a little better than the (even worse) previous agreements, in most cases. Let's hope that India just treats this as a step on the road to much stronger forms of international financial transparency. For more general details, see our September 2010 briefing paper on information exchange between Northern and Southern countries, available on our Information Exchange page.